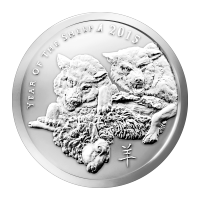 מטבע כסף Silver Shield שנת הכבש שנת 2015 משקל אונקיה The 2015 Silver Shield Year of the Sheep is the first release in the Silver Shield Lunar series. This unique product fits perfectly with the ethos of the Silver Shield collection. The obverse features two ravenous wolves feasting upon a downed sheep. A single sheep dog is howling a warning in hopes of awakening the rest of the ignorant, naive and docile sheep before it is too late. The wolves are baring their fangs and looking directly at us, daring us to try and avoid becoming their prey. The wolves symbolize the evil men who prey upon the unaware in our society. The reverse shows the revised Silver Shield logo with the trivium in the centre encircled by the words "Silver Shield 1 Troy ounce 2015 999 Pure AG" surrounded by 47 bullets. This is a unique take on a Lunar series that you will not find from any other mint. A perfect addition for Lunar series collectors, and a great display piece which is guaranteed to spark interesting conversation! Get yours today, and listen to the warning cry of the sheep dog!